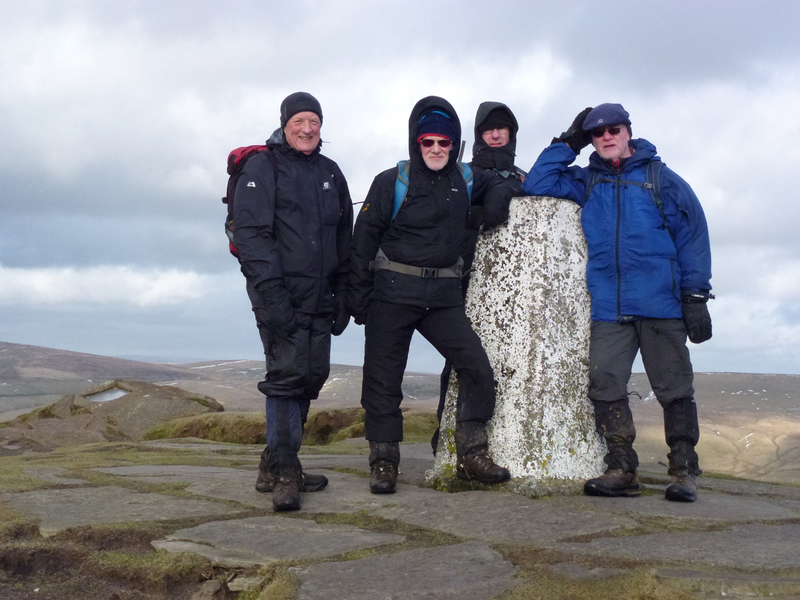 In spite of the forecast of a very windy day, seven members of the Ramblers met at Clough House Farm car park to face the challenge of climbing the three highest peaks in Cheshire. 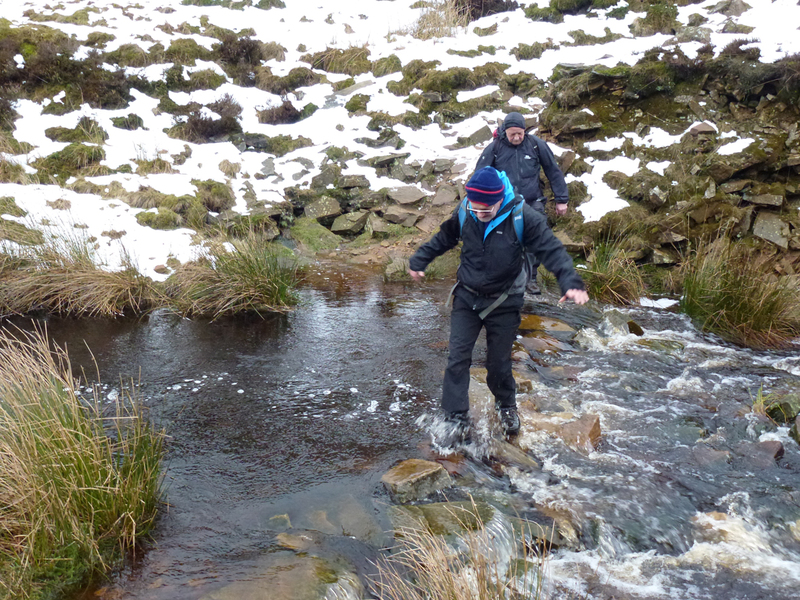 Their route started along Cumberland Brook and on towards Three Shires Head. Crossing over the packhorse bridge, the group headed over rough moorland to join the Dane Valley Way and the made their way over uneven stepping stones across the swift flowing River Dane. 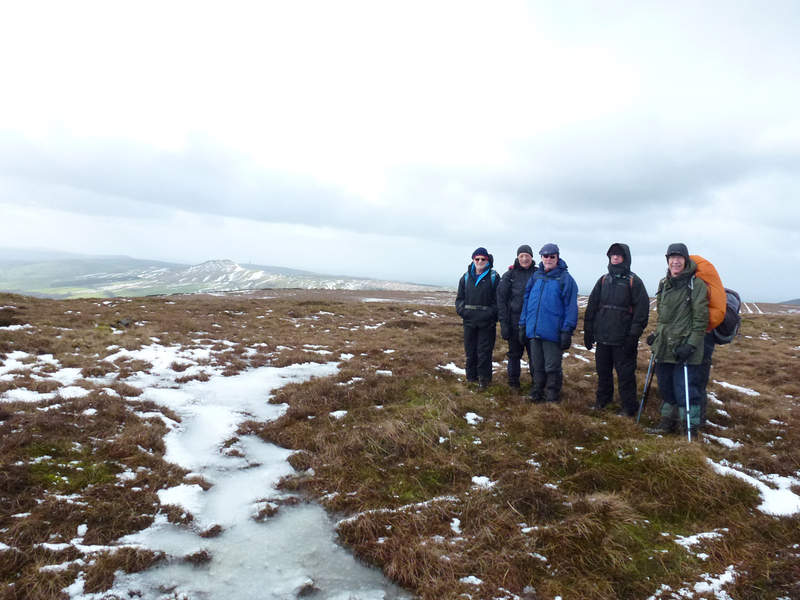 After sheltering for a brief stop in the now abandoned Danebower sandstone quarries, they headed into the bitterly cold gale force winds across Danebower Hollow and ascended over tussocks of grass and heather to the first summit being Whetstone Ridge at 547m (1795 feet). Hurrying across the A537 at the Cat and Fiddle Inn, the next target was Shining Tor, the highest peak in Cheshire at 559m (1834 feet). By this time the wind seemed even stronger and, combined with snow and ice under foot, made the ascent quite a battle. Little time was spent admiring the view from the summit. Dropping down across the rough track over Chest Hollow the route progressively descended before climbing again to reach Macclesfield Forest and some welcome shelter. Leaving the trees behind, the windswept steep sided summit of Shutlingsloe, sometimes called ‘the Matterhorn of the Peak’, at 506m (1660 feet) lay ahead. The group was greeted on the top with glorious views in the late afternoon sunshine, pausing awhile in spite of the unrelenting bitter wind. Finally it was back down to reach the car park after a memorable winter’s day in the hills.